House Representatives Luis Gutierrez (D-IL) and Jeff Flake (R-AZ) introduced comprehensive immigration reform legislation in March. The Security Through Regularized Immigration and a Vibrant Economy (STRIVE) Act addresses border security and the unauthorized immigrant population. It would also create a new guest worker program. On the Senate side, several weeks of meetings between Republican Senators Arlen Specter (PA), Mel Martinez (FL), Lindsey Graham (SC), Jon Kyl (AZ), John Cornyn (TX), Kay Bailey Hutchison (TX), and Secretary of Homeland Security Michael Chertoff, and Commerce Secretary Carlos Gutierrez have resulted in a draft White House proposal that has some similarities to, but also starkly differs from, the Strive Act. Addressing the Current Unauthorized Population. Both proposals would allow unauthorized immigrants to remain in the country to work if they apply for a visa and pay applicable fines. Under the White House draft proposal, immigrants could apply for three-year work visas, renewable indefinitely at a cost of $3,500 per renewal. The Strive Act would permit unauthorized immigrants to pay fines of $500 for a "conditional nonimmigrant" status visa that would be valid for six years. Although the visa would not be renewable, it could be extended while an application for adjustment to permanent status was pending. To become permanent residents under the White House plan, immigrants would have to return to their home countries, apply for a visa through a U.S. embassy or consulate, and pay a fine of $10,000. The immigrant would then be legally permitted to reenter the United States through the same permanent immigration channels open to all foreign nationals. Under the Strive Act, immigrants would be required to "touch back" by leaving the country, even if just to the Mexican or Canadian border, at some point during the six-year visa period. They would also have to pay a $1,500 fine, applicable fees, and back taxes upon their return. Both provisions would require immigrants to undergo a criminal background check, be continuously employed (or in school for most of the year if applicable), and pass the English and civics requirements of the naturalization test in order to be eligible to adjust to permanent status. New Temporary Workers. The Strive Act would create a new visa, the H-2C visa, for the entry of immigrant workers. The visa would be valid for three years and renewable for another three years. To become a permanent resident, an H-2C worker could either be sponsored by an employer or could self-petition after five years of U.S. employment. After gaining permanent residency, the worker could petition for family reunification. The White House proposal, in contrast, would allow workers, but not their families, to enter the United States on a new Y visa to work in a list of approved jobs. The Y visa would replace the current H-2A and H-2B visas (see sidebar). Those in the main temporary worker program could enter for two years, then would have to return home for six months before returning for another two years. After six years in the United States, some foreign workers could be eligible for adjustment to permanent resident status through the normal channels, but they would not be able to reenter on a Y visa and could not stay in the country if a permanent visa remained pending when their Y visa expired. H-2A — for seasonal agricultural workers. Uncapped, but only about 32,000 visas issued in recent years. H-2B — for seasonal workers in nonagricultural jobs. Capped at 66,000 a year. H-2C (under Strive Act) — for temporary workers and their families. Capped at 400,000 initially, subject to annual adjustment. Y (under White House plan) — for temporary workers, with separate conditions for seasonal and nonseasonal workers. Unspecified initial cap, subject to biennial adjustment. Z (under White House plan) — for current unauthorized population, permitting indefinitely renewable, three-year periods of stay. Number set to accommodate current unauthorized population. Seasonal workers on a Y visa could enter the United States for up to nine months before returning home for three months. Seasonal workers could renew their visas for as many years as desired. Both the Strive Act and White House proposal would require various background checks for temporary worker applicants. However, the Strive Act would require a $500 fee, while the White House proposal would require a $1,500 fee. The cap on H-2C visas under the Strive Act would be set at 400,000 a year, but the cap could be adjusted each year depending on market conditions. The White House plan would likewise set an unspecified initial cap that could be altered every two years by the Secretaries of Homeland Security, Labor, and Commerce. The Strive Act also stipulates various wage and labor law protections for H-2C workers, and would protect U.S. workers from unfair competition from H-2C workers. Family Preference vs. Employment Preference. Both the Strive Act and the White House plan would increase the current cap for employment-based, permanent visas (green cards). The Strive Act would increase family-based visas by excluding immediate relatives of U.S. citizens from the annual cap, and increase employment-based visas from 140,000 to 290,000 per year. It would also exempt certain individuals, such as foreign graduate students in technology and engineering fields, from the employment-based visa limits. It would allow each country to use up to 10 percent of total visas each year, up from the current 7 percent. This could help to reduce backlogs of applicants from countries such as Mexico, India, China, and the Philippines, which send the most migrants to the United States. The Strive Act would boost the nonimmigrant H-1B visa limit from 65,000 to 115,000, keeping existing exemptions for those who have earned an advanced degree in the United States. The White House plan would convert diversity and 50,000 parent-preference visas to merit-based visas to emphasize competitiveness and education over family ties. The White House plan would also eliminate the preference for siblings and adult children of U.S. citizens. Under the White House proposal, the current employer-sponsored system would be expanded from 140,000 to 700,000 visas and would be converted into a point system in which categories such as education, skills, English proficiency, and employer recommendation, as well as civic ties to the United States, would assist immigrants in gaining entry. The number and mix of visas could be adjusted periodically to best meet national interests. Enforcement. Both the Strive Act and White House proposal would require certain "triggers" to be met before other measures could be enacted. Under the Strive Act, the legalization and temporary worker programs could begin only after the Secretary of Homeland Security certifies to Congress that improvements in border security are being implemented, that immigration document security is being improved, and that the first phase of a multiphase implementation of mandatory electronic verification by employers had begun. The White House proposal more explicitly defines the trigger to include the following: increasing the Border Patrol from about 13,000 to 18,300; installing 370 miles of fencing, 200 miles of vehicle barriers, and at least 300 miles of electronic monitoring along the Southwest border; fully implementing a program that issues secure identification to all Americans and aliens seeking employment; expanding an employment verification system that can be used for all new hires; and registering all unauthorized immigrants in the legalization program's probationary stage. In addition to the triggers (although not part of the trigger mechanism), the Strive Act would increase enforcement staffing at the border and for the U.S. interior. It would also require infrastructure improvements at ports of entry and along the border, and require DHS to develop an improved border security strategy. The Strive Act would require greater cooperation with Mexico and Central American countries on security issues, improved security features on immigration documents, and compensation for state and local enforcement agencies that assist in immigration enforcement. The Strive Act would increase penalties for gang membership, as well as those for failure to depart after removal orders, reentry after deportation, drunk driving, and immigrant smuggling. The act would also increase federal detention space, and both the Strive Act and the White House plan would increase penalties for employers found with unauthorized employees. Under the Strive Act, mandatory employment verification would be phased in beginning with critical infrastructure employers, such as airports or chemical plants, followed by other employers based on their size. Read the text of the Strive Act here. Read the White House proposed plan here. Building on the White House reform proposal, as well as last year's Senate-approved immigration bill, a group of 10 senators plan to draft and introduce a compromise bill that they hope will become the point of discussion in the Senate for immigration reform this year. The group leading the effort includes the six Republicans involved in drafting the White House plan, and Democrats Patrick Leahy (VT), Edward Kennedy (MA), Ken Salazar (CO), and Bob Menendez (NJ). The senators are aiming to meet Senate Majority Leader Harry Reid's (D-NV) goal of debating immigration on the Senate floor in the last two weeks of May. The 10 senators met with White House officials during the last week of March, and are expected to continue meetings later in April. 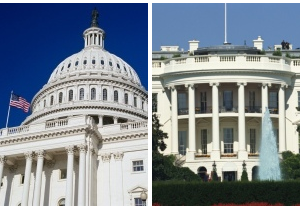 Democrats have expressed their opposition to a number of proposals in the White House plan. However, one experienced Democratic staffer said that if the proposals were "just a temperature read" rather than intractable positions on the issue, there might be a chance of successfully moving ahead with a compromise reform plan. Although a bill has already been introduced in the House, senators remain hopeful that they will approve immigration legislation before the House, where positions on the issue are more extreme. A database key to implementing Real ID requirements will not be ready by the May 2008 deadline due to funding shortfalls, according to the executive director of the organization overseeing the database. The Electronic Verification of Vital Elements (EVVE) database, which would be used to verify birth certificates, will not be ready for all 50 states by the deadline, said Executive Director Garland Land of the National Association of Public Health Statistics and Information Systems (NAPHSIS). NAPHSIS reportedly told the Department of Homeland Security (DHS) that the database would not be ready by May 2008 unless it received $3 million by January 2007. NAPHSIS did not receive the necessary funding, attributing the oversight to an "honest error" by DHS. Because of funding shortfalls and other delays, DHS proposed extending the Real ID compliance deadline to December 2009 if it receives an extension request from a state. DHS Assistant Secretary Richard Barth said that, at present, only seven to 10 states are expected to meet the May 2008 deadline. DHS has requested an additional $1.5 million for Real ID implementation for fiscal year 2008, in addition to the $40 million that has already been appropriated. A portion of these funds are passed along to states in the form of homeland security grants, of which states may use up to 20 percent for Real ID compliance purposes. Read more about Real ID requirements and the deadline extension in the March 2007 Policy Beat here. A bill introduced by Rep. Jose E. Serrano (D-NY), the Child Citizen Protection Act, would grant judges more discretion in allowing parents of citizen children to remain in the United States. Recent raids, intended to crack down on companies that employ unauthorized workers, have divided families throughout the country while detained parents await immigration hearings. Nearly 500 U.S.-citizen children face separation from their parents as a result of the recent raids on Swift Co., QSI Industrial Cleaning Service, Michael Bianco Inc., and Dixie Printing and Packaging Corp. These "mixed-status" families, composed of a combination of unauthorized immigrants, legal immigrants, and citizens, are becoming more prevalent with the growing unauthorized population. According to analysis by the Urban Institute, roughly two-thirds of children with one or more unauthorized immigrant parents are themselves U.S. citizens. The government has no clear policy on what happens to citizen children if and when their parents are deported. Under the current system, a judge cannot allow unauthorized immigrants to remain in the country merely because their children are U.S. citizens. Instead, the parents must prove the child would suffer "exceptional and extremely unusual hardship" in order to avoid deportation. Left with the choice of taking the child to an unfamiliar country, many immigrant parents elect to leave the child with relatives in the United States. Serrano's bill seeks to clarify the options a judge has in deciding the fate of such families. Advocates described the bill as an opportunity for leaders to show they truly value families, and that the health, safety, and well-being of the nation's children are a top priority. Opponents fear that, if passed, the bill would result in a large number of otherwise deportable people not being deported, or that it would encourage unauthorized immigrants to have children in order to gain legal residency. Read the text of the Child Citizen Protection Act here. Read about the Swift & Co. sweep in the January 2007 Policy Beat here. Read a DHS press release about other recent sweeps here. Medicaid for Newborns. The Centers for Medicaid and Medicare Services has reversed its policy and exempted newborn babies from citizenship documentation requirements in their first year of life. According to the Deficit Reduction Act of 2005, newborns whose delivery was covered by emergency Medicaid were required to have proof of citizenship processed and approved before receiving medical coverage (see the July 2006 Policy Beat for more on the Deficit Reduction Act). Many uninsured Americans, including unauthorized immigrants, use emergency Medicaid. The Bush administration will soon issue new regulations stipulating that all newborns will be deemed automatically eligible for Medicaid for one year if their births were covered by Medicaid. Officials estimate that about 8,000 infants have been affected by the documentation requirements. To read a Center for Medicare and Medicaid Services press release on newborns' Medicaid coverage, click here. Naturalization Rates. Legal immigrants have become U.S. citizens at higher-than-average rates over the last decade, according to a study by the Pew Hispanic Center. The study found that the proportion of foreign-born, legal residents that have become naturalized citizens rose to 52 percent in 2005, the highest share in a quarter of a century. The 2005 figures represent an increase of 15 percentage points since 1990. Immigrants from Mexico accounted for the fastest increase in naturalized citizens of any major sending country. The number of naturalized Mexicans increased 144 percent from 1995 to 2005. Read the Pew Hispanic Center report here. Detention Limits. Immigration and Customs Enforcement (ICE) does not always comply with detention period limits for immigrants, according to a recent DHS Inspector General (IG) report. The IG found that while ICE releases 80 percent of detained immigrants within 90 days of their formal order of removal, required custody decisions were not timely in about 20 percent of examined cases, and in 6 percent of cases no release decision was ever made. Federal regulations state that immigrants are entitled to a review after 90 days of detention, and can only be held past the 90-day period if a formal review deems the immigrant a flight risk, a danger to the community, or if travel documents are already obtained or forthcoming and removal is imminent. The IG recommended increased monitoring of detention cases and greater accountability for ensuring timely reviews. The IG also recommended ways to speed document processing and issuance in order to reduce detention times. Read the DHS Inspector General's report, "ICE's Compliance with Detention Limits for Aliens with a Final Order of Removal from the United States" here. Fugitive Backlog. Despite the more than six-fold increase in Fugitive Operations teams and increasing funding, the backlog of immigrant fugitives in the United States has grown from 418,000 in 2003 to 623,000, according to a recent report by the DHS Inspector General. Fugitive Operations teams are charged with locating, apprehending, and removing all fugitive immigrants from the United States. Fugitive immigrants are those who have been ordered removed but have remained in the country. The teams face obstacles that include insufficient detention capacity, incomplete or inaccurate information in the immigration database they use, and inadequate working space. Read the DHS Inspector General's report, "An Assessment of United States Immigration and Customs Enforcement's Fugitive Operations Teams," here. Border Patrol Training. The U.S. government pays over $200,000 to recruit and train a new Border Patrol agent, according to a new report by the Government Accountability Office (GAO). The cost includes about $188,000 from Customs and Border Protection (CBP) for recruitment, training, equipment, deployment, and infrastructure (e.g., vehicles, utilities, and technical support). DHS contributes another $15,000 for each agent's academy training. Read the GAO report "Training New Border Patrol Agents: An Overview," here. Dawn Konet is a former MPI Intern.